programs for youth and adults, and excellent online resources. We have 3 public use computers and open WiFi. Our friendly staff is here to assist you! Swaledale Public Library is funded through city and county property tax dollars. Do you have research to do for school? Do you have a hobby you’d like to learn more about? Do you want to learn more about any topic? Gardening, Business, Herbs, Health, Fitness, History, Culinary Arts, Recipes, Literature, Technology, etc. You will get authoritative magazine, journal articles, and book results. Learning Express is an interactive online learning platform featuring over 770 practice tests, tutorials, and eBooks related to job search and workplace skills improvement, career certification and licensing exam preparation, college entrance and graduate school admissions exam preparation, GED exam preparation, and basic skills improvement in reading, writing, and math, for all ages. You'll get immediate scoring, complete answer explanations, and an individualized analysis of your results. Click on the Learning Express icon to the left to enter the database and create your own account. CLICK on the Transparent Language icon, and make your own FREE account to learn a new language! After logging in, select the language you want to learn from the dropdown menu in the top left of your screen. * 'Learning' is where you'll find your Learning Path, Learned Items chart, and Practice activities. Click the word “Learn” next to any lesson to launch the learning activities for that lesson. Your Learning Path can be customized based on what you want to learn. To select new content to add to your Learning Path, click the Browse icon next to “My Learning Path”. From there, take a look through the content available for your language. (Exact content varies by language.) To add a lesson to your Learning Path, simply click the “+” button next to the word “Learn”. 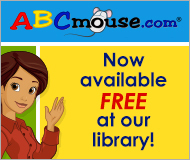 Click on the ABCmouse.com icon to the right to begin!